Blackinton B1762 5 Point Star with Lines Badge - B1762 - 2 1/2" x 2 1/2"
Home > Blackinton > Police Badges > Star Badges > B1762 5 Point Star with Lines Badge - B1762 - 2 1/2" x 2 1/2"
B1762 5 Point Star with Lines Badge - B1762 - 2 1/2" x 2 1/2"
The Blackinton B1762 is a 5 point star with decorative lines on the arms. Each point of the star is decorated with a ball on the tip. Fully customize the B1762 to your own specifications with your department or rank inscribed on the applied panels. You can also choose from a selection of full color seals that can be added to the center of the badge. 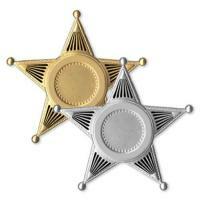 This star badge measures 2 1/2 x 2 1/2 and is available in several bright gold and silver finishes. Please allow 4-6 weeks for delivery of this USA crafted badge. 5 Point Star with Lines Badge - B1762 - 2 1/2" x 2 1/2"
©2002-2019 CopsPlus.com: Blackinton B1762 5 Point Star with Lines Badge - B1762 - 2 1/2" x 2 1/2"